Morning, friends!! So I'm sure you're all not half as excited for me to do my first post with my new kitten claws/points/whatever the kids are calling these things nowadays as I am, but maybe you wish I'd stop going on about the whole thing... Hey, it's the little things. Anyhoo, that day is today! I've got a couple partial collections on deck but I wanted, for myself, to first introduce these puppies in one of my favorites (and also, if you haven't chosen your three free-with-shipping Zoyas this is a great color to have in your stash). 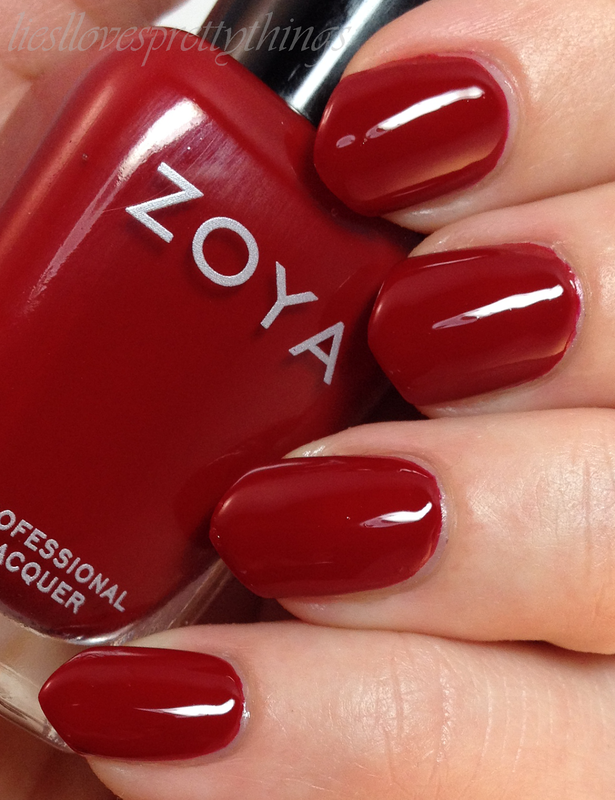 So, without further ado, I present to you my newly shaped nailses in the gorgeous blood red creme that is Zoya Rekha. One more thing, in case you're still planning on taking advantage of Zoya's fab special that ends today (and you should, because there's one more surprise in store once it's over, in the form of a secret code sent to each of us who took advantage of the sale), here are a couple more of my favorite Zoyas-- Raven and Brigitte, the latter of which is from the new Naturel collection (something else I can't shut my mouth about, lol). Final words-- I know stilettos/points/etc are a quite polarizing shape so if mine is now a blog you don't wish to follow because you hate this shape then that's cool. I can almost guarantee you my mamamamama will hate them so you'll be in excellent company if you do, lol. I just ask that you be kind... I welcome feedback but please don't be mean :) And now, on to business as usual. Love the nail look! It's not a shape I can pull off because of my job. Some of the longer stilleto looks I've not been a fan of, but I do like this "shortened" version of it. Was the code supposed to come with the Zoya order? Or are they being emailed after the fact? I just opened my polishes and didn't find anything out of the ordinary in with it. Thanks Stacy :) I don't think my nails look very pretty past a certain length anyway so I'll likely just maintain this for a while (until a tip snaps and I'm forced to nubbify, nooooo!!!!!). Also, what Ali said. I know the cide's being sent out once the sale's over with so I'm glad someone knows when. I'm so excited to see what it's for!! Thanks so much, Lisa <3 I wish I could pull off nubs like you do! Thank you Becca :) And don't be so hard on yerself, Zoyas are awesome and it's a nice deal! What didja get?? 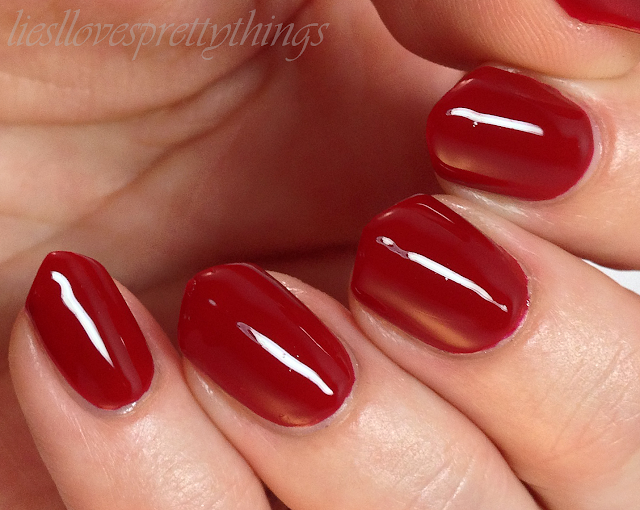 Loving the nail shape, so elegant and you are rockin' the red! Very cool...I've been waiting to see these since you first mentioned them :) I think these look really cool and funky! I like your new nail shape. I don't like the stilletto nails that look like dangerous and you could put your eye out trying to apply makeup, but your shortened kitten nails are really cute on you. I don't know if I would like them on me though as with my nails I'd break all the tips the first day. Does it take a bit of getting used to with the new shape as far as the feel? I'm so used to squovals that it seems like any other shape would feel funny. Thank you!! :) The day I filed them there were a couple times when I'd feel my nails and expect the square edges to be there and they weren't, lol, but otherwise, no, no real difference. They're surprisingly durable, too. The weakest points on my squares were the corners and now I don't have to deal with those, and the middle length of my nail is actually quite strong. Listen to me go on about that and today I'll surely snap one, lol. I'll report back if I do (with nubs...but hopefully not :D). That's what I was thinking. This particular red has always struck me as very evil queen-ish and I thought the two looked just as you said-- dangerous :D They're actually not as conducive to back scratching as my squares, and I think it might have to do with less flat edge? Also, I didn't make the points too sharp. I just found you, I'm not about to dump you over the shape of your nails - I'm not that kind of girl! As it turns out, I think they're really cute on you, and I love the way they look in red! My mom basically said if I get stilettos she will not let me in the house....but we'll see about that! You are ROCKIN them, and that red is amaze. Thank youu sis ♥♥ So far, nothing untoward has happened, comment or otherwise, lol. I can guarantee that while I may go longer with these, I will never, EVER sport duck nails, lol. But maybe that goes without saying ;) Isn't this THE MOST FABULOUS RED?!?! Thanks for the compliment on my color accuracy. I look at my original post and cringe, lol. I almost didn't put that up-- I remember having the worst time trying to get a decent shot of this polish back then but after a certain amount of work, it just doesn't feel right scrapping it, you know? This red is really gorgeous!! Isn't it?! I loooove Rekha. Good on you for resisting! I wasn't going to take advantage because I have plenty of untrieds, myself, but I kind of had those summer glassflecks in my head. That, combined with the facebook buzz, made me cave, lol. Rehka is truly a lovely rich red, very very chic! I actually missed out on the promo; funny story, I was putting off ordering til the last day because I couldn't decide what to do/get, and if I should just add more to get to $25... well, I fell asleep with my laptop on me in bed in the midst of marathon swatch googling/watching an ep of Bones, next thing I know, I wake up squinting at the time & it's 1:30 am so I totally missed the midnight EST deadline! :( I wasn't too upset, but somewhat annoyed with myself. :P My bank account was definitely fine with it! L'mow XD XD XD Yes, more Baby Beau shots are always apropos and if I can actually get the little guy to cooperate for such a shot, then I will indeed post it herre. Saaaad face about sleeping through the deadline but Zoya's always got some awesome promo going. Maybe you can be extra splurge-y for the earth day promo! I'm glad you've found a comfortable nail shape that you can slip into like pair of much-loved sweats!! Although I have ALWAYS thought that your swatches with squares were PERFECTION. Please be respectful and refrain from using profanity or including links in your comments. Posts containing either will be deleted. If you have a blog you'd like me to check out, shoot me a message and your link by using my Contact Me form.